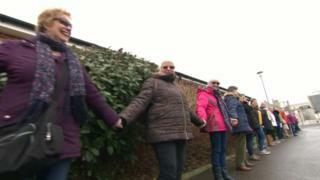 Campaigners fighting to save a community hospital joined hands as part of a protest calling for beds to return. More than 200 people encircled Portland Hospital in Dorset after 16 beds were axed in a shake-up of services. The hospital's beds closed in August 2018 amid staff shortages. The beds are now at Westhaven Hospital in Weymouth. Dorset HealthCare said it was looking to develop the site as a "health and wellbeing community hub". Other services currently carried out at Portland Hospital include sexual health, speech and language therapy, podiatry and occupational therapy. One protestor told the BBC: "Portland have done themselves proud and they have turned out to just show the powers that be we are keeping this hospital." The changes to the hospital are part of the reorganisation of the county's NHS services, which include shutting Poole's A&E. The shake-up aims to avoid a projected funding shortfall, estimated to be at least £158m a year by 2021.